On June 22-24, 2016, the Popular Seriality Research Unit (DFG Forschergruppe 1091 “Ästhetik und Praxis populärer Serialität”) will hold its final conference in Berlin, Germany. After six years, thirteen subprojects, nine associated projects, numerous conferences, workshops, and publications it is time to reach some kind of conclusion. Together with our international collaborators over the years, we would like to explore future possibilities and alternative visions of a “field” that we always claimed existed. Thus, the focus of our final conference will be on the histories, conceptualizations, and methodologies of seriality studies itself. Trying to sidestep the formats of the project pitch, the case study, the “reading” of individual series according to pre-existing theoretical models or their translation into philosophical master vocabularies, we invite scholarly practices—including those just mentioned—to reflect on the challenges and limits of (their contributions to) seriality studies as an ongoing, perhaps fantastical, project that traverses disciplinary and methodological paradigms. Each of the Research Unit’s current subprojects will organize a section. Section formats will vary but they will always stress discussion and exchange. Hence, workshops and panel discussions will provide at least 40 minutes for Q&A. Time limits for papers (20 minutes) and panel statements (5 minutes) will be strictly enforced. We invite paper proposals for sections nos. 3, 7, & 11 by October 31, 2015. Please specify which of these sections you are applying for; note that other sections are already complete. 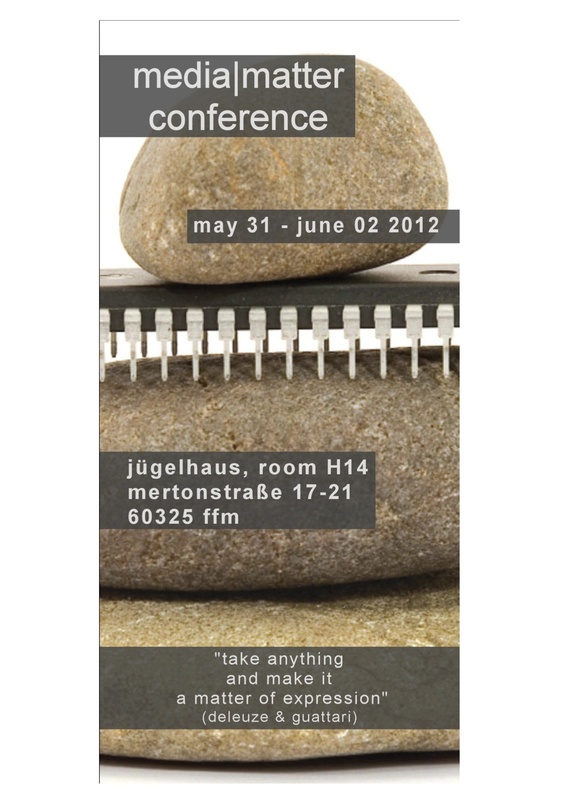 Here’s the announcement I just received from Bernd Herzogenrath for an exciting conference coming up soon (May 31 – June 2, 2012) in Frankfurt. Be sure to click the link above for the conference program, list of speakers (including Bill Morrison, Thomas Köner, Lorenz Engell, and Hanjo Berressem), registration, and other info. 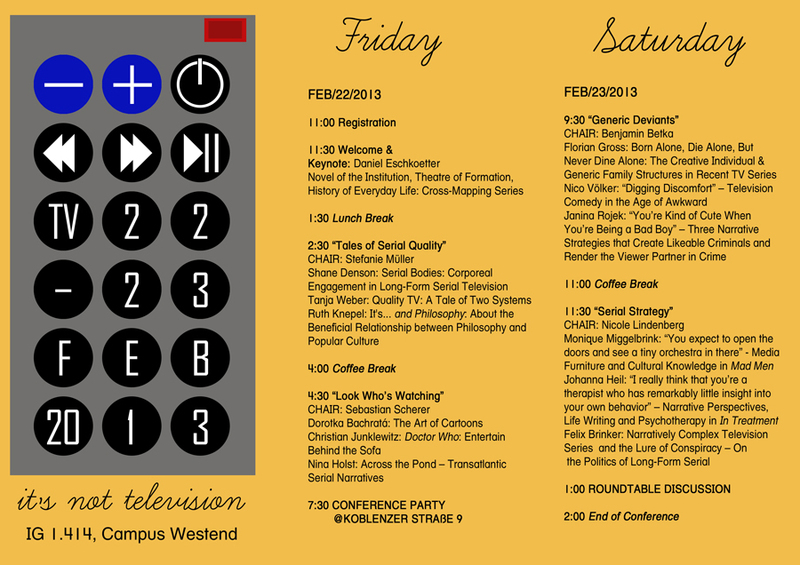 The 2012 media|matter conference reflects the increased interest in the material aspects of our culture, triggered by the material turn as postulated by Deleuze & Guattari, Varela & Maturana, Serres, and others. In consequence we will assess the implications of this blossoming field of research which focuses rather on what represents, than on what is represented. The aim of our conference is to re-focus approaches in culture- and media-sciences and to open up and foster new, interdisciplinary perspectives and concepts towards a revised understanding of media. By highlighting the materiality of the medium and reading this very materiality as medium, questions occur: can content and form still be regarded as separate? Or shouldn’t we rather acknowledge that the matter of the medium affects the message that is conveyed and represented? Shouldn’t we consequently speak of informed matter and of materialized information? In the same way, social- and cultural-sciences cannot ignore the findings of the life-sciences, especially in the fields of complexity-theory and non-linear systems. Thus this conference also intends to bring together artists and researchers from diverse disciplines with differing understandings of media and materiality, not only to create feedback-loops between natural- and cultural-sciences, but also to re-think the somewhat fuzzy concepts of nature and culture.